One of the most astonishing aspects of Baroque art was the use of perspective combined with optical illusion. This artistic practice led to the creation of vertiginous Painted architecture towering up to the sky. The buildings were peopled by the Olympian gods or opened up towards heavenly visions. An unchallenged expert of this technique was the Jesuit painter Andrea Pozzo from Trent (1642-1709). He combined a complete theoretical knowledge with a perfect mastery of painting techniques as well as outstanding organisational and teaching skills, which enabled him to manage and complete vast sacred and profane decorative programmes in Rome and Vienna – i.e. in the centres of papal and imperial power – but also in Piedmont and Tuscany, while his production of altarpieces and apparati effimeri (temporary celebratory architecture and decorations) were found throughout Italy. In the work of visually celebrating the glory of the Catholic Church and the Saints, Andrea was assisted by his brother Giuseppe (1645-1721), he too a cleric (in the order of the Discalced Carmelites). Less versatile than his more celebrated elder brother, Giuseppe Pozzo was, however, an ingenious architect and designer of altars conceived to amaze church-goers and strengthen faith by foreshadowing the splendour of paradise. Evidence of this are his masterpieces that can still be admired in the churches of Venice, where he worked for a long time. 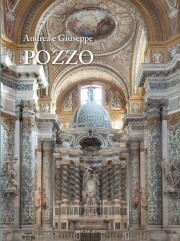 This book contains the papers by twenty leading experts who came to Venice in 2010 for the conference promoted by the Fondazione Giorgio Cini and the National Committee for the Celebrations of the Third Centenary of the Death of Andrea Pozzo. They explore the main aspects of the Pozzo brothers’ artistic output, who are brought together for the first time in a publication that reflects their vast influence on Baroque art in Europe and the rest of the world.